L-carnitine was discovered in Russia, and one year later in Germany. The proper name, Carnitine, refers to the Latin origin, (carno, caris). Its structural formula was decoded in 1927, and its physiological significance was understood by the 1960’s. (http://www.hlthmall.com/l-carnitine.html) L-carnitine is synthesized in the liver and kidneys, from two essential amino acids, lysine and methionine. This synthesis requires the presence of vitamins niacin, B6, and iron. Most (98%) of the carnitine supply resides in the body’s muscle tissue. Approximately 80% of the amino acids our bodies need is endogenously synthesized, the remaining 20% are referred to as the essential amino acids. The supply of such aminos, like l-carnitine, must be supplemented exogenously. L-carnitine is available in the following food sources: red meat, diary products, avocado, and tempeh. Although a well balanced diet can provide approximately 75% of what the body is lacking, often conditions arise that make it difficult to obtain all the carnitine one needs. It has been established that an adequate supply of l-carnitine is necessary for the maintenance of good health. 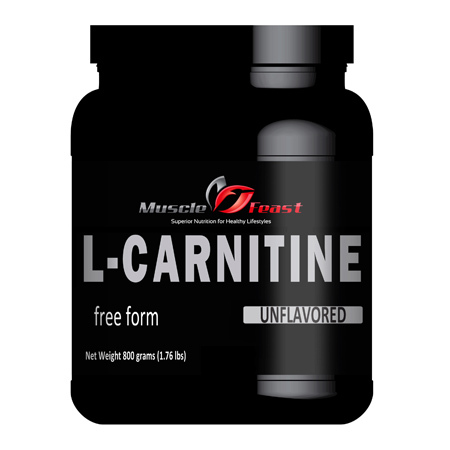 L-carnitine transports long-chain fatty acids across the mitochondrial membrane to be metabolized. L-carnitine aids in the release of stored body fat, tryglycerides, into the bloodstream for energy. Tryglycerides are the major source for the production of energy in the heart and skeletal muscles. Access to l-carnitine is believed to increase energy levels for long-term aerobic activity. L-carnitine is also responsible for muscle contraction, regulation of protein balance and maintenance of a healthy heart. Research also suggests that an adequate supply of l-carnitine could be instrumental in the treatment of diabetes, chronic fatigue syndrome, kidney and liver disease. (http://www.healthlink.com.au/nat_lib/htm-data/htm-supp/supps72.htm) Since its involvement in the process of burning fats is of most importance to those interested in endurance and body fitness, it is this topic that will be focused upon. Weight loss – Because of the role l-carnitine plays in transporting long-chain fatty acids for metabolism, it is thought to play a key role in increasing the amount of fat the body can turn into energy. Studies on L-carnitine appear to be all over the board, but it is clear that it will only be beneficial in weight loss when calorie consumption is also reduced to facilitate the burning of fat. In other words, if you take this supplement and burn fewer calories than you take in, you will definitely not see any benefit because the body will never get to a condition where the burning of fat is necessary. Physicians most commonly recommend L-carnitine supplements for heart-related problems, as noted by the Digital Naturopath website. A study published in a 2009 issue of the American Journal of Clinical Nutrition shows that L-carnitine supplements reduce low-density lipoprotein cholesterol–the so-called “bad” cholesterol–blood levels in people with type 2 diabetes. Neurosurgeon Russell L. Blaylock, in his book “Health and Nutrition Secrets,” notes that studies indicate L-carnitine slows and even reverses some types of dementia, including Alzheimer’s disease. Age-associated disorders such as depression, impaired cognition and decreased mental alertness may be partially because of L-carnitine deficiency, according to a review of studies by Juvenon, a producer connected with the University of California at Berkeley. Because the main function of L-carnitine is to help the body burn fat into energy, L-carnitine supplements are commonly taken for energy boosts, although a review of studies by Vanderbilt University shows that clinical results are inconclusive. Our L-Carnitine powder is assayed by the manufacturer to be 99.5% pure, according to HPLC standardized testing methods. It contains no fillers, taste additives, or anti-caking agents. Notes: This product is hydroscopic and may clump.